Souvenirs, namely: hats, tee shirts, sweat shirts, jackets, warm up pants, shorts, sweaters, shirts, sport shirts, golf shirts; briefcases, cups, mugs, glasses, pens and pencils, flashlights, rings, watches, mouse pads; paper products, namely: stationery, note pads, writing paper, notebook covers, binders, calendars. Information products: namely video tapes, audio tapes, compact disks, books, manuals. Providing training courses of a fantasy nature in aspects of special operations training and police training. On Thursday, July 24, 2003, a canadian trademark registration was filed for the above pictured logo by Brendan James William OLIVER 486 Upper James Street, Hamilton, ONTARIO, CANADA L9C2X8. The Canadian IP office has given the trademark application number of 1185490. The current status of this trademark filing is Registration published. The trademark is filed in the description of Souvenirs, namely: hats, tee shirts, sweat shirts, jackets, warm up pants, shorts, sweaters, shirts, sport shirts, golf shirts; briefcases, cups, mugs, glasses, pens and pencils, flashlights, rings, watches, mouse pads; paper products, namely: stationery, note pads, writing paper, notebook covers, binders, calendars. Information products: namely video tapes, audio tapes, compact disks, books, manuals. 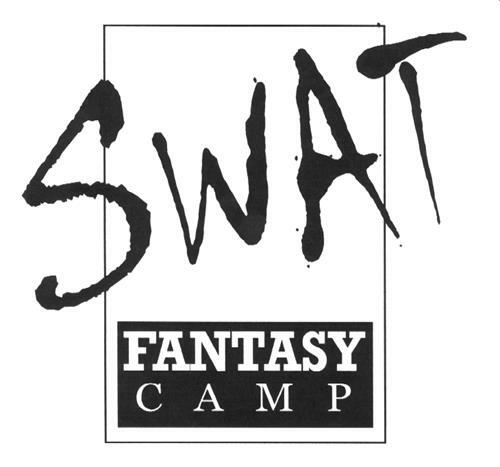 , Providing training courses of a fantasy nature in aspects of special operations training and police training. .
Mark Disclaimer: The right to the exclusive use of the words SWAT and FANTASY CAMP is disclaimed apart from the trade-mark. (1) - Souvenirs, namely: hats, tee shirts, sweat shirts, jackets, warm up pants, shorts, sweaters, shirts, sport shirts, golf shirts; briefcases, cups, mugs, glasses, pens and pencils, flashlights, rings, watches, mouse pads; paper products, namely: stationery, note pads, writing paper, notebook covers, binders, calendars. Information products: namely video tapes, audio tapes, compact disks, books, manuals. (2) - Providing training courses of a fantasy nature in aspects of special operations training and police training.